Patients with legal access to medical marijuana reduce their consumption of conventional pharmaceuticals, according to a demographic review of patient characteristics published online in the Journal of Psychoactive Drugs. Investigators affiliated with the Medical Marijuana Research Institute in Mesa surveyed responses from 367 state-qualified patients recruited from four Arizona medical cannabis dispensaries. Respondents were more likely to be male, in their mid-40s, and daily consumers of cannabis. Respondents most often reported using cannabis therapeutically to treat symptoms of chronic pain, muscle spasms, nausea, anxiety, arthritis, depression, headaches, insomnia, and stress. Patients typically said that cannabis provided “a lot of relief” or “almost complete relief” of their symptoms and that its efficacy was greater than that of more conventional medications. Patients also reported reducing their use of pharmaceuticals. Over 70 percent of respondents reported using other medications “a little less frequently” or “much less frequently” for 24 of the 42 conditions specified. Over 90 percent of those who reported consuming cannabis to mitigate symptoms of nausea, headache, muscle spasms, fibromyalgia, bowel distress, and chronic pain acknowledged using pharmaceuticals less frequently once they had initiated cannabis therapy. 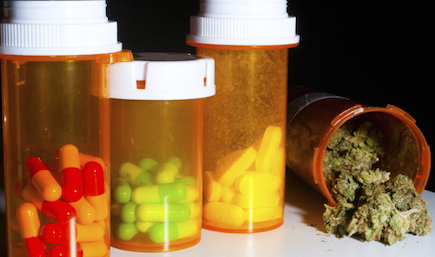 Previously published survey data of medical cannabis patients similarly report subjects’ willingness to substitute cannabis for prescription drugs, particularly opioids.